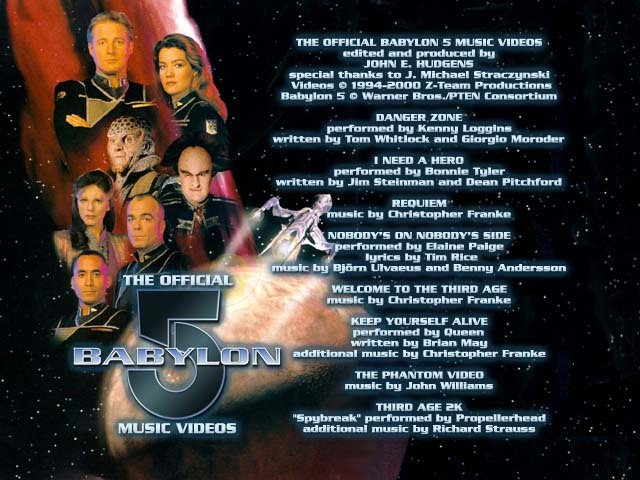 - In addition to being a fan of what was arguably one the best shows on television (Babylon 5), I also collaborated with series creator J. Michael Straczynski on the creation of promotional music videos for the show for him to use at science fiction conventions, and later to promote the show to networks. These could originally only be seen at Joe's or my own convention presentations - there were eight of them in all, and for years they were not available to the fans in any form but live presentations. However, in Decemeber 2008, Joe finally allowed them to be posted online - you can see them all grouped together below. In May 2004, we lost Rick Biggs much too early to an unexpected heart problem. Rick and I had always been friends at conventions, and since I wasn't able to make it to his memorial services in California, I dealt with my feelings by making a memorial tribute video. I was able to quickly get it to Pat Tallman, who ran it after Rick's memorial. On February 13, 2006, we lost Andreas Katsulas to lung cancer. Unfortunately, it something many of us knew was coming, but it's still hard to accept and deal with it actually happening. I never hung out with Andreas like I did with Rick, but he told me once how much he liked and appreciated the work I did on the official B5 music videos - that meant a lot to me. So even though I hated the circumstances under which I came up with this, I did a tribute video for Andreas as well, to honor him and his performances in my own way. I've been told the video for Rick touched a lot of people, including his family - I hope this one did the same for Andreas' family and fans. For the 20th anniversary of B5 in 2012, I was commissioned by the Phoenix ComiCon to create a new memorial video for not just the other major cast members of the B5 family who had passed since I did the Andreas memorial, but for everyone who had passed. This debuted at the Phoenix reunion panel, and we got it online that same night for all the fans who couldn't make it to the event. And a note to the rest of the B5 cast: I don't want to do another one of these anytime soon, so take care of yourselves! - All five seasons (plus the movies and Crusade) of Babylon 5 are now out on DVD from Warner Bros, so there's no reason not to have seen the show!